There are two important marine biologists associated with the naming of this species. The author, Ernst Marcus, and Joel Hedgpeth, who was honored by the patronym. Let me first begin this nudibranch of the week with a discussion of the Life and Times of these intriguing scientists before I proceed to describing the typically (it IS a nudibranch) beautiful slug. 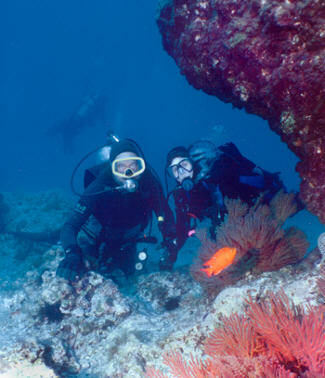 They both played major roles in the development of our understanding of marine biology and biodiversity. Along the course of this discussion, we will also understand the synergism between Ed Ricketts, John Steinbeck, and other major investigators of the US western coast marine invertebrate fauna. Although both scientists studied some of the same groups of organisms (especially the pycnogonids), they differed greatly in their methods of study. Joel Hedgpeth was primarily a field biologist, working between the Pacific tides, whereas Ernst Marcus spent his years dedicated to dissections of organisms under the microscopes of his Brazilian university. Ernst Marcus was born 8 June 1893, and studied invertebrates at the University of Berlin and the Entomological Department of the Zoological Institute Museum. He married the biologist and illustrator Eveline du Bois-Reymond in 1924. Dr. Ernst Marcus was promoted to Associate Professor at the Zoological Institute, University of Berlin, but in 1935 he was dismissed from his job because of the disgustingly prejudicial laws against Jews. tardigrades, turbellarians, and molluscs (lamellaracea and opisthobranchia). It is for his and Eveline’s opisthobranch publications that we most remember him in this website! Joel Hedgpeth, in contrast, worked amongst a group of invertebrate zoologist colleagues along the Pacific coast of California: Ralph Smith, S.F. Light, Ted Bullock, Olga Hartman, Wheeler J. North, George and Nettie MacGinitie, Cadet Hand, Ed Ricketts, etc. He was born in Oakland, California, 29 September 1911, and has been publishing for nearly every decade of his life. He is a true genius, and one who cares for the environment about which he wrote scientifically. He was the Director of the Pacific Marine Station (University of Pacific) in Dillon Beach, California, from 1957-1965, and was the Oregon State University Marine Science Center Director (1965-1973). You and I both know that this major active fault zone (between the Pacific and North Atlantic plates, which together constitute nearly 3/5ths of the earth surface) cannot be measured by 1 km. Dr. Hedgpeth’s conservation comments to the 4th edition of Ricketts & Calvin, “Between Pacific Tides” (p. 450) need to be emphatically re-read, along with viewing the photograph of the vacuous space left after the attempted construction of the power plant right on the San Andreas Fault Zone. www.tmbl.gu.se/libdb/taxon/personetymol/index.htm (scroll down to find Hedgpeth). He edited the “Treatise on Marine Ecology and Paleoecology” (Volume I, Ecology, 1957, Geological Society of America, Memoir 67), and was the major revisor of the 4th edition of Ricketts & Calvin’s “Between Pacific Tides.” Together with Ed Ricketts he wrote “The Outer Shores.” Their friendship probably was based on “a poem, a stink, a grating noise, a quality of light, a tone, a habit, a nostalgia, a dream” (John Steinbeck). Joel and Ed were fine friends and colleagues for many years (hence it was appropriate that Dr. Hedgpeth became the revisor for the editions after Ricketts’ untimely death on 11 May 1948). He wrote, “...Ed, the friend of many visits at Pacific Grove during those days I drove my mother down to see her old friend who lived where there is now a supermarket...” (4th edition, page ix). In this preface, he describes a Weltangschauung (a word well known and understood by L.S.R. Bergh, E. Marcus, J. Hedgpeth, L. Schmekel, T. Gosliner, D. Behrens, myself, and many other readers of this site to whom I apologize for not mentioning) created by a convergence of philosophical, theological and scientific observational styles and intellects, and of nudibranchs seen, across centuries and ocean basins. Following this tradition, the west coast of the Americas (from South America to Canada) is probably the major opisthobranch research center and focus today. There is a special concentration of nudibranch workers in California, from the Bay Area to almost the Mexican border. 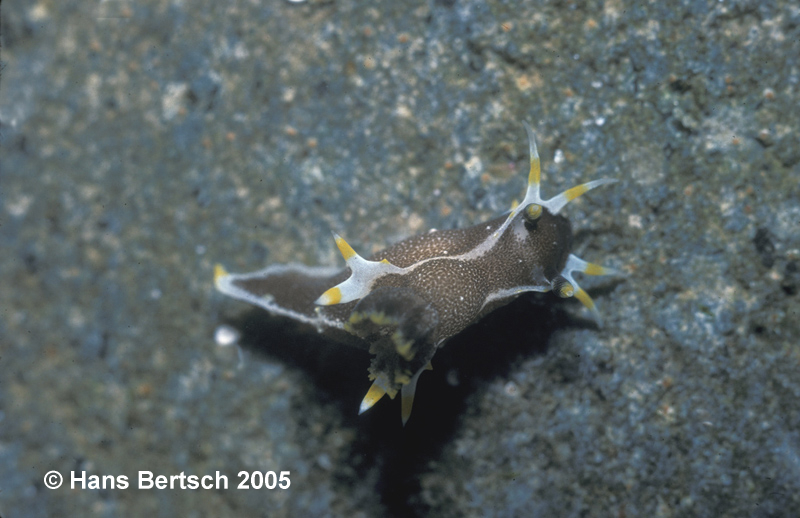 Which now brings us to this week’s featured nudibranch, Polycera hedgpethi. The beautiful polyceratid (on the right hand side, alongside with congener Polycera atra) reaches 25 mm in total length. Please note the adjectival form of the genus and family “polyceratid.” This is based upon the correct Greek (despite some web publications by authors that do not know Greek)—the plural is based upon the genitive ending kerat— so any adjectival or other derivations will use that root. Even the ICZN code (1999) was in error saying that the Latinized stem for the formation of the family-group name is kera. The Latin word kera has nothing to do with the Greek keras, but means “wax”—a totally different root and derivation. I am in the process of writing a formal emendation of this error. The prior code, actually lists this proper usage of the Greek and its Latinization (Appendix D, “Recommendations on the Formation of Names,” see especially p. 219). For some regrettable oversight or error, this appendix was not published in the 4th edition of the Code (nor was it retracted for obvious reasons!). Polycera hedgpethi has the generic-typical head veil, with 4-6 pointed processes. The overall body color is brownish, with closely set white specks. There is a distinct white line between the frontal veil (which circles the outer edges of the rhinophores) to the gills, and a distinct solitary white line from the gills to the end of the prolonged foot. My colleague Dave Behrens (1991) described the rhinophores, gills, and extrabranchial appendages as tipped with yellow, as was the tip of the tail. This species eats bryozoans. It has been reported feeding upon Bugula, but I have also found it upon encrusting forms of this phylum In this UW 1/5 photograph, the nudibranch is actually fairly well visible. However, sometimes one must look more closely. Its egg mass is typically polyceratid— a loose ribbon of 1 and a half or so coils, attached to the surface, and with the free edge slightly convoluted. What a curious zoogeographic distribution this species has! It is serendipitously peripatetic, with a you-can’t pin-me-down occurrence—like its patronym Dr. Hedgpeth. It was originally reported from central/southern California; it has been reported from BahÍa de los Ángeles, Baja California, Mexico; PanamÁ; Australia; New Zealand; and South Africa. Maybe the most likely explanation for this bizarre distribution is by “boat introduction.” At BahÍa de los Ángeles, the small yachts that dock there probably obtained the nudibranch larvae and encrusting bryozoans from larger ships in major Mexican or southern Californian ports. Well, that’s it! Obviously we need more information (seasonal, geographic, size, breeding, feeding, etc. ), so if you see it, please take pictures, document everything (place, date, depth, etc. ), and send them to Mike Miller or me. Maybe someday we can do a Polycera hedgpethi“revisited” based upon your photographs and observations. Please use Dr. Joel Hedgpeth’s observation: interested enough to watch, not to collect so it dies in some glass enclosure. Polycera hedgpethi is a beautiful animal, so go look for it! © The Slug Site, Michael D. Miller 2005. All Rights Reserved.